Ready to elevate your personal performance and leadership? We help physicians and health care leaders who want to elevate their personal performance and leadership and sustain vitality, productivity and organizational collaboration. 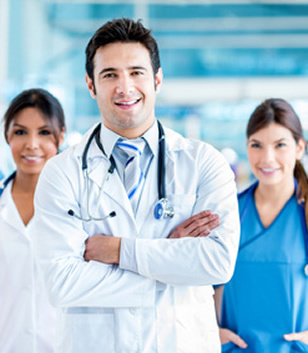 Our clients are mostly physicians growing into positions of increasing responsibility, leadership, and influence. They are highly successful healthcare executives and physicians, often promoted to a new job that takes them out of their clinical environment into administrative roles and requires them to adapt to new professionals and situations while developing new leadership and collaboration skills. These are department chairs, managing partners, medical directors, program directors and chiefs of staff who long to care for people, earn a good living, and to make a dent in the world’s suffering along with a desire to improve their organizations. They stepped forward, spoke up and became leaders. Typically our clients are bright, vibrant, passionate professionals aspiring to flourish as a physician, scholar, scientist and a leader in their field. The expertise they do NOT possess is how to stay aligned with their purpose and calling and enjoy and thrive with academic success and responsibilities as a leader. However they are often under-qualified to lead. In medical school, they were trained to treat pneumonia. They didn’t learn how to steer employees through a corporate matrix to meet organizational goals and hit budget targets. They are haunted by self-doubts, insecurities and lack of know-how. But they are ready to transform their inner blocks into empowering actions and results. You are new in your leadership position and may not have much leadership experience. Perhaps you’ve been recently promoted. You field an ever-growing number of requests to collaborate on projects, fill leadership roles, sit on committees, give talks, write letters, review papers, and more. But you may not have the tools and practices you need to align your daily choices and activities with what you most value. You have endless demands of work and home which leave you feeling you will never catch up. The promised freedom to focus on your scholarship never seems to materialize. The pressure for funding remains even as margins narrow and sources of financing dry up. The time you spend completing administrative tasks and chasing grants limits the time you spend on the work you care most about. Even when you are seeing patients, you feel like you are on a treadmill. You are extremely successful but success leads to requests. You field an ever-growing number of requests to collaborate on projects, fill leadership roles, sit on committees, give talks, write letters, review papers, and more. As you started your career, it was important to say yes to opportunities, now you need to practice saying ‘no’ if you are going to be able to say yes to what you care about most. You are already doing more with less – responding to a host of pressures and demands. The metamorphosis from bedside physician to leader is not easy. The traits that made you a top-notch clinician doesn’t motivate others to do their best work. Your team members don’t seem to be reaching their potential. Managing others increases rather than decreases your workload. Instead, you spin your wheels, discuss things, which are actually a level below you, and put off dealing with the hard issues. You have a great team, but it’s bogged down by conflict, competition, for limited resources, or poor communication. Communication challenges bring stress and conflict. In relationships with others, you find yourself reacting and coping rather than choosing and leading. You get caught up in the weeds and focus on tactical issues, rather than showing leadership by being strategic in thinking and action. Your organization leaders are talented people, but getting them on the same page and headed in the same direction is an ongoing challenge. You struggle with leadership and collaborations, and are challenged retaining the joy of leadership and life balance. You long for tools and practices that you can use to encourage everyone to become accountable and to help them become more fully engaged. You understand the need to transform care models and move toward value-based, patient-driven systems, but you also feel intense pressure to deliver revenue and improve cash flow. Meanwhile, your clinical responsibilities don’t let up. So you really need the tools and ideas to decide where to focus your efforts to leverage performance and productivity and sustain it over a period. If one or more of these scenarios is true for you, please read on. You’re in the right place. There is help for you here. Some clients are section chiefs and department chairs. Others are researchers transitioning from early to midcareer. Still others are physicians in leadership roles. You are young medical professional and a leader growing into positions of increasing responsibility, leadership, and influence. Needing skills in leadership, management, want to grow to be more effective at communicating and resolving conflict., productivity, negotiation and organizational behavior, organization development, communications, proposal writing, and many more. An expert in what you do but struggle with leadership and collaborations, and are challenged retaining the joy of leadership and life balance. You are involved and teaches, educates or trains young medical graduates, including those in residency and fellowships. Need skills in stress management, presentation skills, writing, conflict management, organizing, negotiation, team building, communication, diversity, language, personal growth and professional growth. You are committed to excellence at personal, interpersonal and systemic level. You are involved in research and grant writing and fund-raising. Needing skills in writing, creative thinking, envisioning, mentoring young researchers and speaking and influencing. You are a self-employed professional or member of a health care professional team and your focus is on making a contribution. Who is most likely to succeed using our resilience and vitality-based approach to leadership? Our clients and customers typically share many of the following characteristics. If these fit you as well, you are likely someone we can help you thrive by being a resilient leader, dynamic presenter and communicator. And be surrounded by vibrant and collaborators at home and work. Committed to making a contribution to science and medicine – Above all else you are interested in making an impact and a difference with your patients, students and colleagues. High standards of excellence – You have a relentless spirit to ‘push the envelope… always seeking that next level of growth, achievement and potential. Playing safe and being ordinary are not an option. Very knowledgeable about your specialty – You strive to be true a true leader in your field of expertise, creating resources for the next generations. Passionate and sincere professional – committed to enhancing life – You are brilliant and smart and willing to innovate and experiment new ways to achieve results. Realize you need a support team to function optimally and live a balanced life – And you are willing to collaborate and be more effective at communicating and resolving conflict. Willing to leverage your potential to benefit your family and your organization – You value people and the potential of the human spirit. You know this is the why you spend endless hours and years becoming a doctor. Committed to mutually supportive relationships – You realize the importance of interconnectedness and interdependency, with that the importance of feedback loops. You are ready to invent your future – rather than be dictated by it. You can see the possibilities and are ready to transform those possibilities into reality. Now learn more about how we work with our clients.